Author: Claire Foullon is a Senior Research Fellow in the Centre for Fusion, Space & Astrophysics, Physics Department at the University of Warwick. Flows and instabilities play a major role in the dynamics of magnetised plasmas. A transfer of energy takes place naturally in flow-driven instabilities, a classic example of which is the Kelvin-Helmholtz instability. This instability occurs when two fluids flow at different velocities parallel to a surface of discontinuity, e.g. at the transition between the air and clouds see Figure 1, with a strong enough shear to overcome the restraining tension force. The phenomenon is well understood in fluid and gas (hydro-)dynamics, but is much more challenging in magnetised plasmas, including the solar corona, magnetospheric  and heliospheric boundaries, cometary tails and astrophysical jets. Numerical simulations  are helpful to show how surface waves develop “non-linearly” into rolled-up vortices. Yet, many unresolved issues remain to be addressed. The non-linear effects and some multi-scale and microphysical interactions are believed to play a role, e.g., in plasma entry across a discontinuity, generation of turbulence and enhanced drag. However, in order to clarify the efficiency of macroscopic instabilities in these processes, we require proper knowledge of their overall morphological features. Recently we showed the first observations of the temporally and spatially resolved evolution of the magnetic Kelvin-Helmholtz (KH) instability in the solar corona. Unprecedented high-resolution imaging observations of vortices developing at the surface of a fast coronal mass ejecta were provided by the Atmospheric Imaging Assembly (AIA) experiment on NASA’s Solar Dynamics Observatory (SDO). 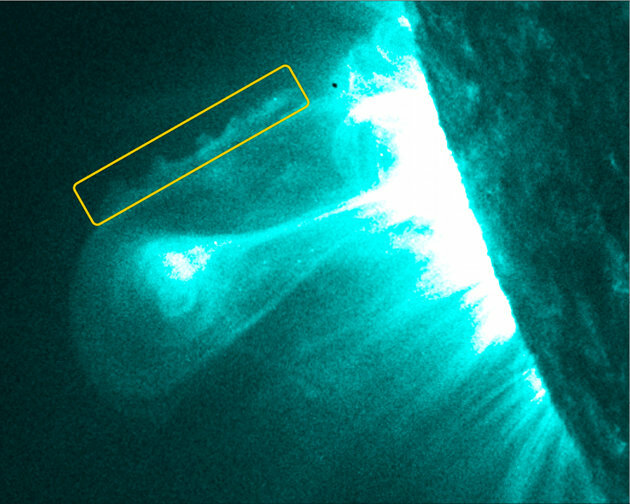 Figure 2: SDO/AIA image showing a fast coronal mass ejecta erupting from the Sun, with KH waves detected on its northern flank. SDO was launched in 2010 and provides unprecedented views of the Sun in multiple temperatures. The new SDO/AIA observations provided images of a coronal mass ejection in the extreme ultra violet at a previously unobserved temperature – 11 million Kelvin. On examining these images, it was possible to spot a familiar pattern of instability on one flank of an exploding cloud of solar material that closely paralleled instabilities seen in Earth’s clouds and waves on the surfaces of seas. For the first time we were able to directly validate theories of the non-linear dynamics involved in magnetised plasmas. What made this observation even more interesting is that the instabilities appear to form and build on one flank of the CME. This new observation may give us a novel insight into why these CMEs appear to both rotate, and be deflected away from following a simple straight path from the surface of the Sun. If the instabilities form on just one flank they may increase drag one side of the CME causing it to move slower than the rest of the CME. The new findings are a cornerstone for developing a unifying theory of flow-driven instabilities in rarefied magnetised plasmas. This is important in shedding light on the fundamental processes at work in key regions of the Sun-Earth system. A detailed description of the work presented in this nugget may be found in .